Enjoy other Wordless Wednesday posts here. A beautiful balcony love the colors, the design is not unlike one which I noticed earlier this week. I wondered how often it got used. My theme is two too. Beautiful. I love the planters. That is a very beautiful sight and the flowers looks so amazing. You really did a good job of capturing this. Pretty! Love seeing flowers!!!! Happy WW! Looks like a great place to sit down and enjoy the warm air, with a few beers watching the world go bye. I think I need to go on holiday...real soon! Beautiful balcony! I'm assuming the view from the other side is just as lovely! That almost looks like one of those "what's different" puzzles. Not much difference other than the density of the flowers in the planters. Love the balcony. Would be a nice addition to any home looking for the old fashion feel. Sukhmandir Kaur: I agree with you about the colors. I think that's what attracted me to take the photo. Yakini: It was actually an overcast fall day, but the colors make it look warm. Caite: Cheery colors for cold days. Simply Delicious: I agree about the planters. 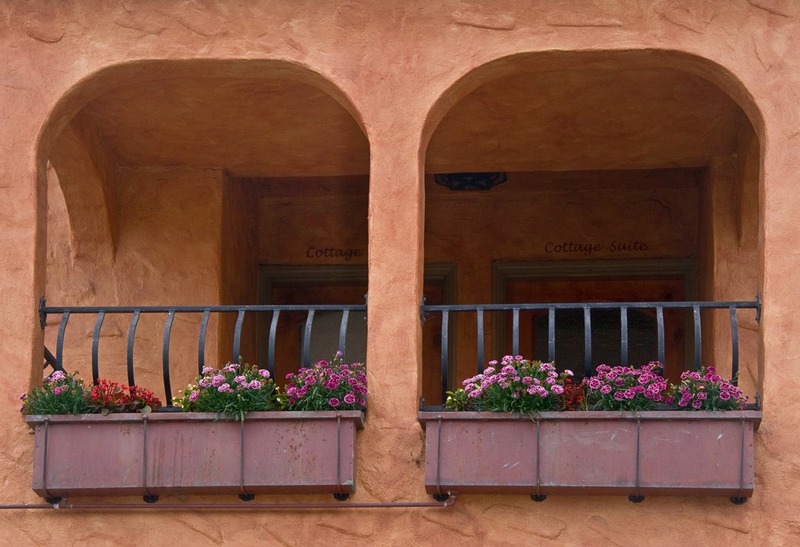 They and the flowers go well with the exterior color. Lina: I didn't see that eyes and smile until you mentioned it. Eds: Thanks! It's a nice touch to the overall architecture. Catsynth: Unfortunately, the winter weather has returned. I, too, enjoyed the little summer weather we had last week. Scrapchick: The caretakers do a good job in maintaining the flowers. Carol: I didn't notice the other side of the balcony. I think the best view was here. feefioto: I think they're symmetrical? flutietootie: Now that you mentioned it, I wouldn't mind the same balcony, but then it'll be the neighbor who will enjoy this view. how lovely. the flowers definitely add a nice touch to the balcony. My first impression wad that it was Spanish, I could sit there all day with my señorita. I like this photo! Something about it makes me want to go on a cottage holiday to Spain or Portugal. Life Ramblings: I think it was the flowers too that caught my eyes first. Ryan: Enjoy your meals and drinks! Emm: Thank you! Your idea sounds lovely.